For the longest time now my ever expanding makeup collection has stressed me the hell out. 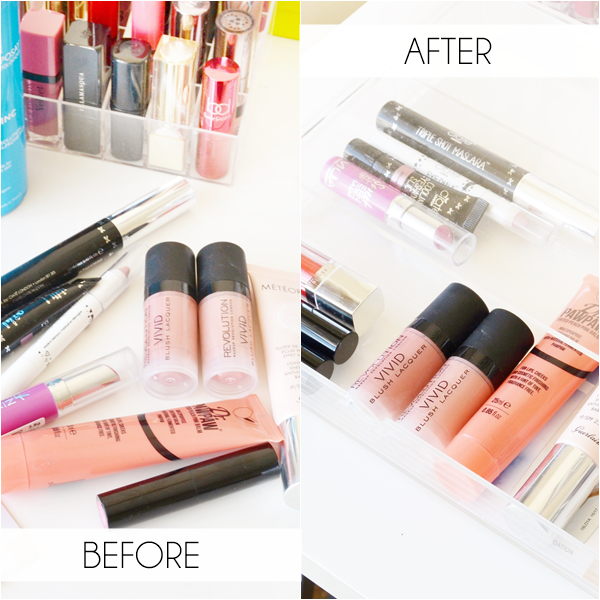 Okay, that sounds like such a first world problem, which it actually is, but this is a beauty blog after all and I'm pretty makeup obsessed... soo it's totally valid in my opinion! My dilemma was that as soon as I purchased a new lipstick for example (ha, as if would ever be singular) I would store it away in my abyss of lip products for it to never be seen again. I resorted to leaving new products loitering on my desk but that soon equated to a very untidy looking heap of products that I'd constantly knock off my desk when doing my makeup glasses-less. Just not good! But then! I had a light bulb moment! 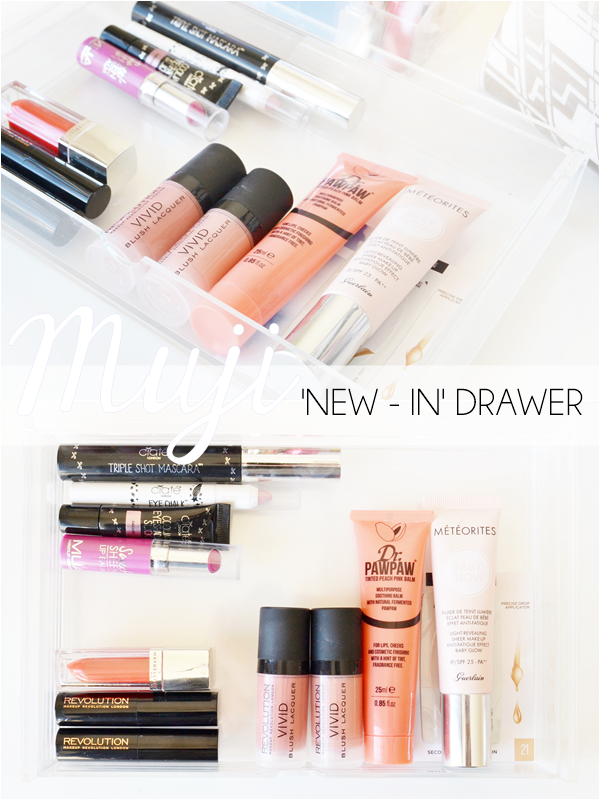 What about a 'new-in' basket to store new products in? Then I could try them out for a few weeks and the keepers could then be moved into my current makeup storage. However I decided to go one better than that and instead of using a boring old plastic basket I opted to use one of my Muji drawers - a much more atheistically pleasing option. So now my first world problem is solved and I have my pretty Muji Flip Top Box (£8.50 - Muji here) next to me on my desk that gives new products pride of place. However price wise if you are thinking of doing the same the 2 Drawers narrow box, still with a flip top lid (here) is the exact same price and would definitely give more space. As for what I currently have in my 'new-in' box - Of course multiple new lipsticks: Makeup Revolution in End With Beginnings and She's Up All Night, MUA Sweet Sheen Lip Tints in French Violet and Maybelline Colour Elixir in Signature Scarlet. Some wonderful new products from Ciate: Eye Chalk Pastel Eye Pencil in Marshmallow, Cooling Eyeshadow Slick in Daiquiri and Triple Shot Mascara in Espresso. Dr. PAWPAW Peach Tint Balm. Makeup Revolution Vivid Blusher Lacquer in Heat and Heart. And lastly Guerlain Météorites Baby Glow Sheer Foundation which is oh so beautiful! Looking at this little box of new makeup does make me happy!